1. Outline of time distance methodology, with S-time-matrix format to present data over many units and over time, two generic statistical measures S-time-distance and S-time-step. The new generic time distance approach, which is easy to understand and to communicate, offers a new view of reality that significantly complements existing mostly static measures of inequality in many domains. In the information age this new view of the existing databases should be evaluated as an important contribution to a more efficient utilisation of the existing data. 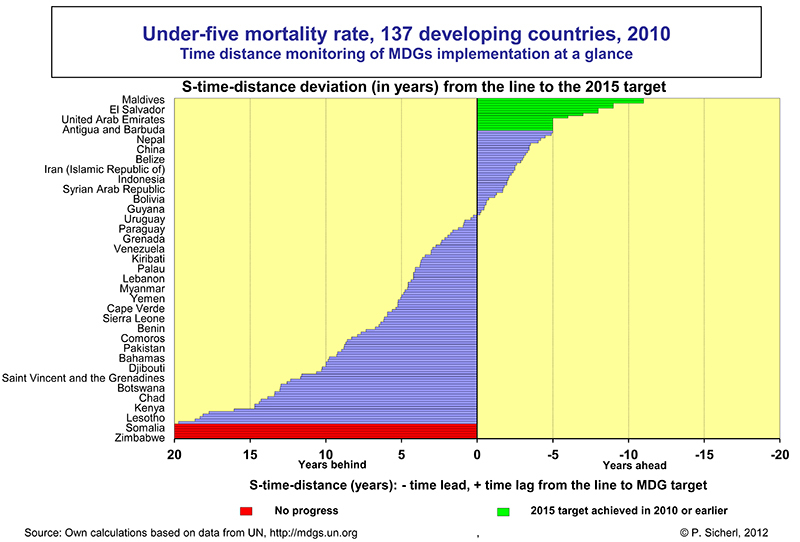 b) details for implementation of four MDG indicators for 125-154 countries, year by year. It provides new parallel system of monitoring implementation of targets based on deviations of actual values from the line to the target, thus complementing (not replacing) the existing mostly static measures of inequality and of implementation of targets. Expressed in time units, S-time-distance is easily understood by policy makers, managers, media and general public, thus being an excellent presentation tool for policy analysis and debate. It can help us to form a new perception of the magnitude of the gap between the implementation and proclaimed targets for a given indicator as well as across more indicators. 3. This study offers a system for time distance monitoring implementation of targets for many domains and levels (global, regional, national, local, business). The detailed application to current MDGs could be immediately applied for the post-2015 SDGs targets when they are determined. It can be with the help of Sustainable Development Solutions Network facilities further refined and distributed to complement existing methods of monitoring implementation. We added complementary possibility to look at indicator differences in the parallel universe of time, adding new vocabulary in the semantics of discussing and analysing differences in the real world. Free web monitoring tool is provided. SDG initiative is an important field where this additional dimension could be fruitfully applied making some aspects more transparent and understandable to people as the main potential beneficiaries and participants in the implementation.